No matter what field of design you choose to specialize, identity is always something to consider. Whether you’re an icon designer or a calligrapher your job is to work with ideas that match companies and concepts. Identity design generally follows the same pattern for both web and print work. It does cover a wide variety of subjects but it’s easy to learn given the proper resources. In this post I’d like to cover some tips for building a scalable identity. There should always be a relationship between company branding and other elements on the page. By following these strategies you’ll be well-equipped to start designing your own brands without much hesitation. The most important aspect of an identity design is the initial phase. This is where you come up with ideas and eventually pick the right one. And much like all areas of life, the most important phase is often the most difficult. How do you come up with something from nothing? Where should you get ideas from? How do you put them down into tangible resources? Almost every talented identity designer will advise starting on paper. You can start by writing down words or by doodling sketches. You don’t know how to draw? Just start. Most digital designers can dramatically improve their workflow by learning to draw, and you don’t need to learn fine art either. If you do more conceptual work like photo compositing, then learning to draw won’t help you much at all. But identity design is a visual medium where you need to create icons/logos/mascots/graphics from scratch. You can do this much quicker with pencil and paper. A good place to get started is by doodling and following ideas you see online. Of course, if you want to be really good it’s worth learning fine art and drawing from life. But at first this may seem impossible. So get started with simple doodles and just get comfortable holding a pencil. While brainstorming ideas you should be working with a theme. Randomly drawing stuff isn’t gonna cut it. Instead consider the purpose of a company and what they do. Who do they serve? What would their audience be receptive towards? The answers to these questions may help you find tone, context, and purpose for your ideas. You should think about how to best explain an idea using the clearest visuals possible. At first this will be hard. Like really hard. It takes a lot of practice to reach professional level but that doesn’t mean you shouldn’t try. Identity goes into everything from websites to letterheads and stamps. You have to think about this ubiquity and design something that will become recognizable on any medium. I recommend starting with some ideas about the company. Write down a list of words associated with the company’s goals and primary functions. Think about design from a marketing perspective and consider which ideas could be targeted at vital demographics. While a logo is only part of the identity, it’s still an important part. Most identity designers start off with a logo concept and branch out into other aspects of the identity with restyled icons, smaller/larger graphics, and simplified typographic effects. While designing a logo stay focused on the bigger picture at hand. It’s easy to lose yourself in your creation and just start being artsy for the sake of art. Design is not for the sake of design. Good design has a purpose. Good logos convey meaning and recognition. They visually represent a company and often provide a certain feeling in people. You really need to think of logos as symbolic representations of ideas. Work with allegory, metaphor, and exaggeration. Use symbols and geometry when appropriate. Symmetry and asymmetry are both useful to create balance. Color selection is also a big aspect, but it’s such an expansive topic that you shouldn’t worry much about it until the later stages. Also remember that scalable identities need vector-based graphics. Illustrator and Inkscape are two programs fit for vector output. Choose one and do your best to learn the ins-and-outs of every tool. 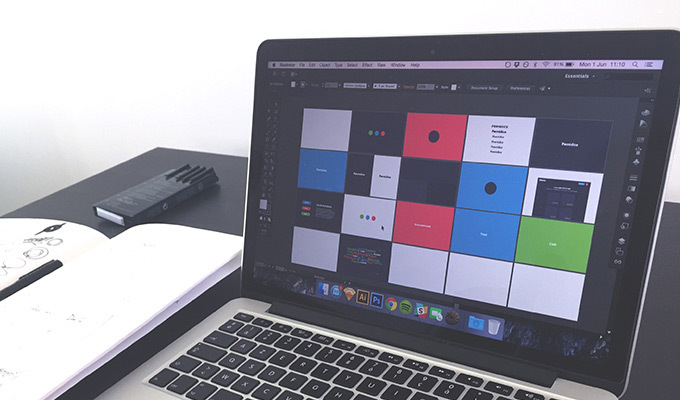 Both print and web designers can pull value from branding guides. Brand/style guides are popular in every area of business from entertainment to technology and retail. These guides outline specific rules for brand typefaces, colors, logos, patterns, and even copywriting. There is tremendous value in creating a style guide on your own just for practice. You’ll learn which components are necessary and why. You’ll also see why branding is so important to a company’s image. Back 10 or 20 years ago every brand guide was in book form. Designers created PDFs and they’d be printed off for different employees or executives. Nowadays most guides are kept as PDFs or even created as websites. The digital age is not going anywhere and it offers so much in the way of flexibility. You can design a brand book without any knowledge of printing or binding. Truthfully you should only be concerned with your skills as a creative designer. Paper to pencil is definitely a must for someone who seriously wants to improve their identity design skills. Beyond that you just need to learn the right software and stay hungry. Identity design is a huge umbrella term with many underlying assets. Learning to design is about more than just software and it takes first-hand knowledge to recognize this fact. Over time and with practice you will notice improvements in your work. Stick to your guns and keep churning out the best stuff you possibly can. Look around the web for ideas and gather feedback from others. You’d be surprised how much can be accomplished in 6-12 months.